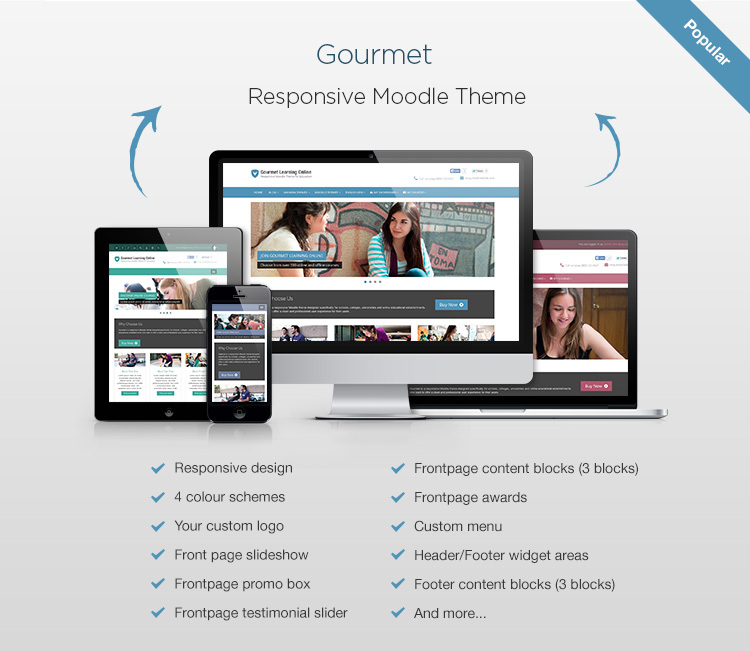 Gourmet is a responsive Moodle theme perfect for colleges or universities. The landing page has all the essential elements for promoting your e-learning portal and courses. The overall design is clean and professional and especially tailored for higher education Moodle sites. There are 4 colour schemes for you to choose from in the theme and you can also implement your own colour scheme by overriding the default theme CSS. This theme is built on the popular Bootstrap 3 framework and there are plenty of handy Bootstrap components you can use within your Moodle site (example 1 | example 2). We have released a responsive Mahara theme “Groove”, which is designed to visually match our Moodle theme “Gourmet”. If you are planning to set up a seamlessly integrated Moodle and Mahara installation (“Mahoodle”), you need to check out the “Groove” theme. I need to customise the theme. Do you have documentation for it? Do I get free future updates of the theme? Yes. If there is an available update for the theme version you bought we will email the update to you absolutely free. You can check the theme Changelog to see the theme updates. Please make sure you whitelist our email (elearning@3rdwavemedia.com) so the update emails don’t end up in your spam folder! Extract the /gourmet/ folder and the files.